Roots Music is an expressive art form, and nowhere can you find a more expressive musician than the mystic violinist Anne Harris. Rolling, blending and folding in a variety of musical influences from Celtic to Americana to Funk, she embodies a musical genre-morphing sound that is all her own. Anne is an internationally recognized instrumental talent that has captivated audiences around the globe. Her command of the stage is punctuated with a free reeling and coiling whirlwind of sound and visual excitement. Her gypsy-like stage presence is truly unforgettable and revolutionary in the ever expanding musical world that surrounds her. Wielding the torch of a veritable Creole dynasty, being born into one of the first Creole families to settle in St. Landry Parish, Marcella has now planted the seeds of her South Louisiana heritage deep into the bluffs of Memphis, TN — no small victory for a young woman just now rounding out her mid-20s. Simien is a natural in the truest sense. 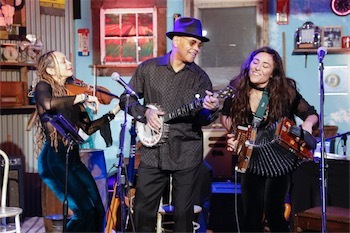 Daughter of two-time GRAMMY award winning Zydeco luminary Terrance Simien, she was practically born onstage, and grew up thoroughly immersed in sound and performance. Yet, despite her almost fairytale-like upbringing, Marcella makes it her mission to forge her own pathways in the music business. A graduate of the prestigious Memphis College of Art, Simien boldly follows her heart. Her music is a dueling hybrid of classic Memphis soul and the freewheeling swagger of New Orleans funk, woven together with the sighing laughter of her ancestors: that Creole accordion. As outspoken and courageous as she is sensual and feminine, Simien holds a wisdom far beyond her years. With each honeyed undertone, every saintly holler, with each tinkle of the keys, and every pump of the squeezebox, she reinvents the mold and soldiers against boundaries, yet she never fairs to respect tradition. Guy Davis has spent his musical life carrying his message and music around the world, from the Equator to the Arctic Circle, from the Plains of Kansas to the tundra of Siberia. His work as a singer, musician, actor, writer, and music teacher have earmarked him as a renaissance man of the Arts. Davis’ much-praised 1995 debut, Stomp Down the Rider, on the legendary singer-songwriter label, Red House Records, marked the arrival of a major talent, earning acclaim for his deft acoustic playing, his well-traveled voice and his literate yet highly accessible songwriting. He’s barely rested since then, taking his music to television (The Conan O’Brien and David Letterman shows) and radio (Mountain Stage, World Cafe, E-Town, Woodsongs), as well as performing at theaters and festivals around the globe. He played the Ukraine in summer of 2014, just a week or so before the statues of Lenin were torn down. He even played for the visiting Queen of Denmark when he performed at a children’s home in Greenland. “I feel like I’ve only hit three corners of the world, with a lot more to go,” Davis says.